The illustrations were mainly selected by Brigadier R. G. Thurburn, C.B., C.B.E., and Major N. P. Dawnay to both of whom the author is much indebted. Plate I figure A is taken from the Blenheim Tapestries and shows one of Marlborough's foot soldiers in 1708. It was reproduced in Churchill's "Marlborough, His Life and Times," published by Harrap in 1931. The belts and musket sling are buff, the knapsack, hanging behind the right arm, is a dark brown or black bag, and the cartridge box on the right hip is black with a brass monogram. There is a flap pocket in front of the cartridge box and the selectors consider there are three embroidered buttons below it. The brass hilt and black scabbard of the sword show plainly. 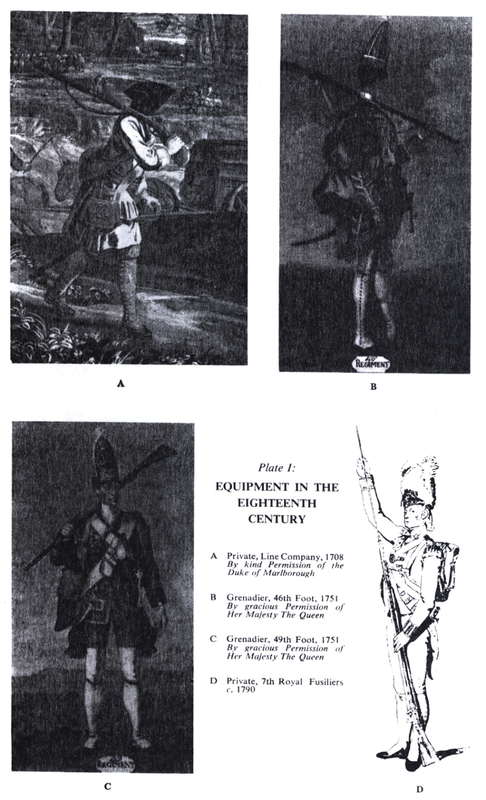 Figures B and C are from Morier's paintings of Grenadiers of the 46th and 49th Foot of 1751 in the Royal Collection. 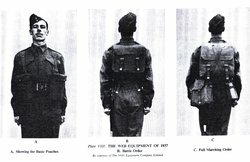 The 49th man wears crossbelts, both have a grey canvas haversack with three buttons slung over the left shoulder hanging on the right side over the large grenade pouch (which went on a crossbelt) and a black hide knapsack slung over the right shoulder. The 46th man has a cartridge box on a waistbelt which goes under his coat. 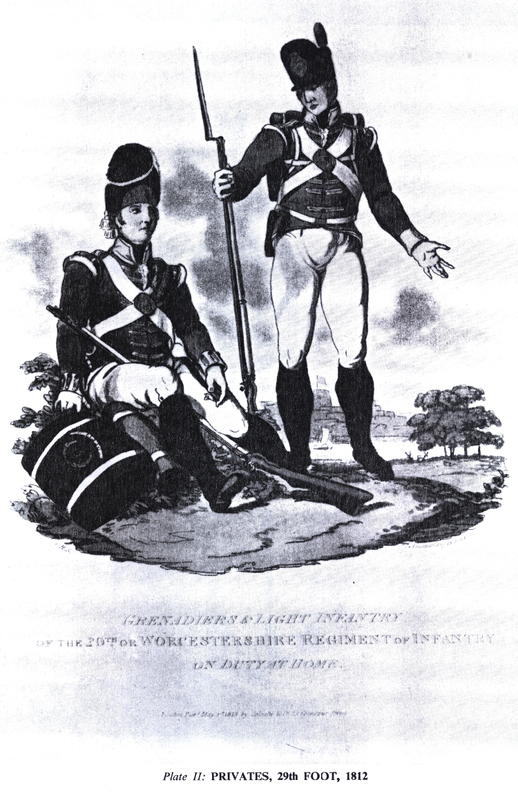 Figure D shows a private of the Royal Fusiliers c. 1789-1790, after an engraving after E. Dayes. He is ramming a charge home in his musket. A white goatskin knapsack is slung over both shoulders, square on his back, with a strap across his chest between the two straps over the shoulders. 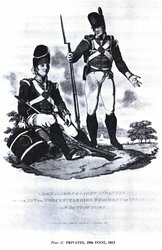 Plate II shows two privates of the 29th Foot in 1812 after C. Hamilton Smith. One is a Grenadier and the other a Light Infantryman (see reference 24). They are on home service and the knapsack is worn as in 1790. But not all units had the box knapsack; some had oilskin or glazed canvas packs and the 28th, for instance, had calfskin knapsacks captured from the French at Alexandria in 1801. The haversack and waterbottle were worn on the left side over the bayonet, and the greatcoat or blanket as shown on top of the knapsack. The Light Infantryman has a thin waist strap holding his pouch and bayonet steady. Plate III. A Light Infantryman of the 3rd Foot Guards, after E. Hull in 1828. The cartridge box and bayonet on the crossbelts show plainly. The former is well behind the right hip and the latter has the haversack and waterbottle over the bayonet. The rolled greatcoat and the mess-tin are on top of the box knapsack. Plate IV shows four figures of the 77th Foot c. 1840, by M. A. Hayes. There is little change from the last plate except that the bayonet and cartridge box are touching, the latter is lower and more inaccessible than ever. The figure on the right has the brush and picker for cleaning the pan and touch hole of the flintlock hanging from the belt plate. Presumably a custom in some units. Plate V A. Taken from Fenton's collection of photographs at Sebastopol in 1855. There is only one crossbelt left, holding the cartridge box; a waistbelt now takes the bayonet and a small expense cartridge box, not shown. The water bottle is on the right. Plate V B. From a W.O. 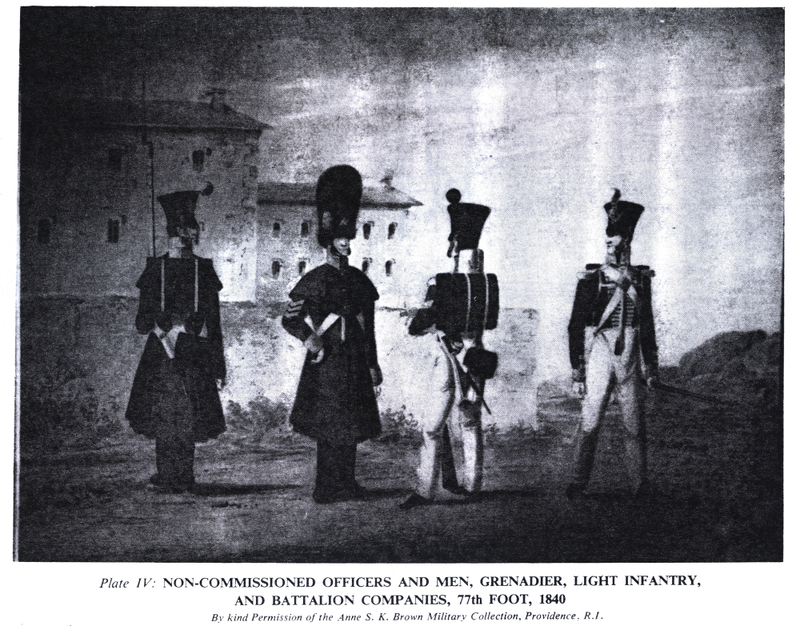 Text Book, "Exercises of Infantry 1862." The Trail. The knapsack is smaller and carried lower without a chest-strap. A cross belt on the left shoulder is still worn with the cartridge box and a waistbelt takes the bayonet and a small cartridge box. Note the pouch for percussion caps on the cross-belt, fairly high up. Plate VI A. From a Parliamentary Paper. The Valise Equipment of 1871. This sideways figure shows all details. The crossbelts have gone and a valise replaces the knapsack. Plate VI B. 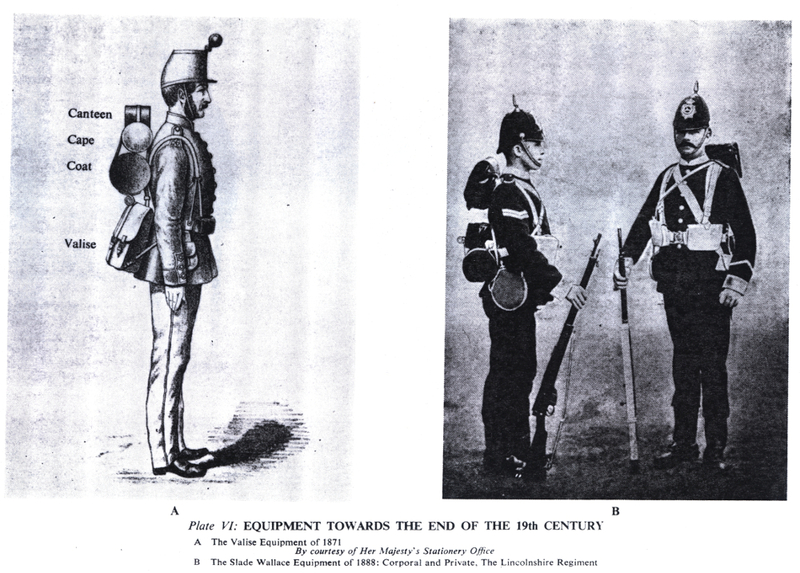 The Slade Wallace Equipment of 1888. Reproduced from "The British Army by a Lieutenant Colonel," pub. Sampson Low 1899. Haversack on the left and waterbottle on the right. See in text. Plate VII A-B. 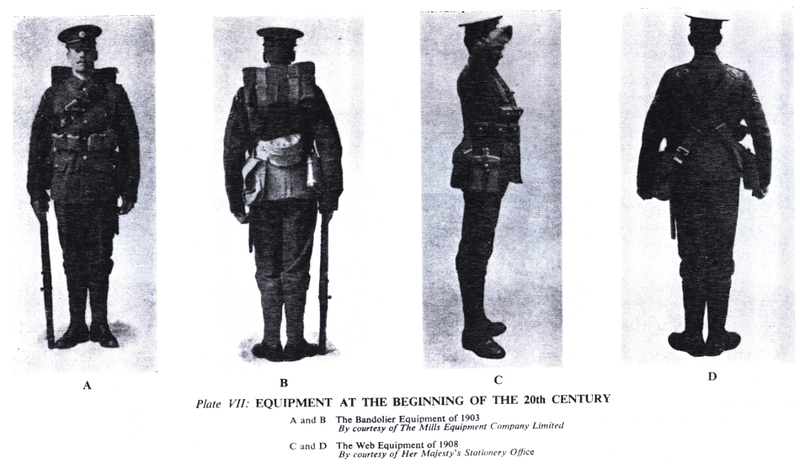 The Bandolier Equipment of 1903. This and the following plates are from Lethern (see in text and reference). Plate VII C-D. The 1908 Web Equipment of the first World War. Plate VIII A-C. Three figures showing the 1937 Web Equipment. The first figure shows the Basic Pouches. During the period covered by this account the infantry soldier had to do two things—he had to march, carrying enough on his person to make him more or less independent of other modes of transport and he had to fight, using some form of shoulder firearm, for which he had to have on him enough ammunition for immediate needs. If he had too much weight to carry he could become incapable of being an effective fighting machine. The weight must be disposed in such a way as to impede his actions as little as possible and it was of paramount importance that his ammunition should be absolutely easy of access, so that he could reload after firing with the utmost speed and the least possible exertion. As Wellington summed it up—"a soldier with a musket cannot fight without ammunition. He can use up all he can carry in two hours." It is with these two problems, how much weight must be carried and how it must be disposed about the man's body to obtain the greatest possible efficiency, that this account deals. Modern medical opinion has long ago decided that a soldier should not carry more than 33% of his own weight, and a horse, mule or camel not more than 25% of their weight. A rough estimate would fix the weight of the soldier's load at about 45 lb., usually far exceeded and almost never adhered to! The weight of the infantry shoulder firearm, musket or rifle, has remained roughly constant at about 10 lb. and a further 18 lb. has amply covered the weight of ammunition to be carried. 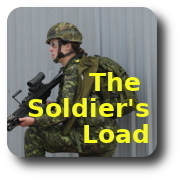 The rest of the soldier's load has usually been divisible into two parts, his fighting kit without a knapsack or pack or in civilian parlance rucksack, or his marching load including his pack. Normally either a greatcoat or a blanket is carried in either case, a weight of about 8 lb. and also a waterbottle, about 2 lb., and possibly another 2 lb. of rations. What else is or is not carried constitutes the great problem; the amount given above comes to about 30 lb. more or less and then there are clothes and boots, etc., worn by the man, to be added, roughly 12 lb. So we have reached a total of about 40 lb. or rather more already. And there are still a great many more articles of equipment to be considered. Obviously only experts can decide as to what shall be carried. As Major Renbourn has stated—"the psychologist must consider the requirements, plan the experiments, consider all the relevant data, and then advise; but the final decision will always have to come from the commanders in the field who alone are intimately conversant with the soldier's function, etc. Hence the load carried and the Personal Load Carriage Equipment will probably always be a compromise between what is physiologically sound and what is operationally essential." This last phrase is capable of great variations. Apart from the items already enumerated with approximate estimates of their weight or other portions of a man's kit may be much affected by climate and local conditions. Both blanket and greatcoat have been mentioned—both would be necessary if troops were bivouacking in a cold climate. One should be enough in a warmer climate, so during the Waterloo campaign only the blanket was carried. The amount of rations carried will be discussed later; food weighs heavy and can be cumbersome. The British army has never carried what the French call tentes d'abris unless transport was available; sections of them add considerably to a man's load. Some form of entrenching tool, usually weighing from 3 to 4 lb., became in time a necessity, sometimes an axe was carried, and the kit itself, the so called "neccessaries," such as spare boots, shirts and socks, were another problem. The Roman Legionary has already been mentioned, at one time he is said to have carried a saw, basket, spade, axe, a leather thong, sickle, chain and three days' rations. He had to entrench his camp every night and so had to carry all his own tools.5 On the other hand many of the enemies of the British soldier in the past have been fighting men like the Zulus and tribesmen of the N. West Frontier of India, who carried nothing but their arms, often a shield as well and usually fought handto—hand, when the less encumbrances the soldier carried the better. So it could in such cases be of importance to have some of the "operationally essentials" carried on pack animals or wheeled transport. The foregoing is a more or less general survey of the essentials involved in the problem of what the infantryman should carry. We now go on to see what he did have to load himself up with during the 300 years covered by this survey. 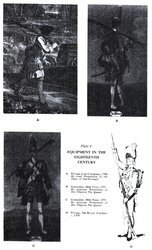 Although the British Army as we know it was not raised until 1660, it inherited so much from the regiments who fought on both sides in the Civil Wars that they must be included in this survey. By 1660 the heavily armed pikeman had virtually disappeared and will not be considered; incidentally he was so weighed down by his armour that he was not available for picket duties or night guards. The musketeers wore no armour and, according to Firth, [Footnoted: Firth, Cromwell's Army, Methuen, 1912, pp. 107, 108.] carried a load of over 60 lb. ; Buchan [Footnoted: Buchan, Montrose, Nelson, 1928, p. 186.] puts it higher. A reliable contemporary authority, Sir James Turner, [Footnoted: Pallas Armata, 1670. Quoted by Renbourn (1), p. 3.] writing in 1670, says—"each man should carry his own knapsack and four or five days provision of meat and two lb. of bread and cheese per diem. In his knapsack he should carry two shirts and two pairs of stockings, a pair of shoes and at his girdle a hatchet. This would not weigh as much as (the pikeman's) head piece and corslet." The knapsack of canvas or fur, slung over one shoulder, dated from 1631. We should call it a haversack. [Footnoted: Renbourn (I), p. 5, says that the knapsack carried "Essentials" and the haversack "Neccessaries." But in the nineteenth century the knapsack carried the "Neccessaries," change of clothes, cleaning materials, etc., and went on the back, and the haversack rations. It hung on the left side below the belt.] Firth states that seven days' biscuit and cheese were carried, at the rate of a pound of the former and half a pound of the latter per diem. The knapsack cost ninepence. Up till 1800 the British infantryman had no greatcoat, the long skirted full bodies coat, which cut up into a waistcoat when part worn, was always considered a fairly adequate covering. No waterbottles are mentioned before the reign of William III. The sword or hanger carried for many years weighed about 3 lb. Turner does not say if he considered the men were overloaded and it is possible that neither he nor they thought so. He had seen much service. By 1700 the matchlock musket was being replaced by the flintlock with a bayonet but no rest. It would have weighed about 12 lb. With the bayonet and took a paper cartridge, containing both bullet and charge. The priming flask was retained, the bandolier, large flask, wooden cases, ball bag and match disappeared and the rate of loading was from one to two rounds a minute. The cartridges were slung over the left shoulder in a leather box with a close fitting lid. It hung on the right thigh towards the front and was easily accessible. Above it hung the knapsack or haversack and the bayonet hung with the sword on the left. According to Sir John Fortescue [Footnoted: Fortescue, Vol. II.] in 1705 Marlborough's men carried 50 lb. without the musket and by 1711 the load weighed about 70 lb. This was the kit carried during the war with the revolted North American Colonies. Transport was scarce, supplies were very difficult to obtain locally and with the exception of the Light Infantry companies the men were overloaded. [Footnoted: JOURNAL, Vol. XLIV, p. 73, for an overall view.] A book on Military Hygiene, described as a classic [Footnoted: By Sir John Pringle, physician to the Duke of Cumberland, see Renbourn. P 4] and written a little earlier, said that "the soldier was ready to sink of fatigue under the weight of his arms, accoutrements and knapsack." Coats were now tight and narrow and black gaiters were worn. Bunkers Hill, the first battle of the war, was fought in 1775. An official report [Footnoted: Fuller, Decisive Battles of the Western World, Eyre and Spottiswoode, 1955, Vol. II, p. 284.] states that a total of 60 lb. was carried, including three days' rations, 60 rounds, part of a tent (this seems to have been unusual) and a blanket. Other unconfirmed sources[Footnoted: Robert Graves, Sergeant Lamb of the Ninth, Methuen, 1940.] put the total as much higher at about this date. The knapsack was made of white goatskin and hung over the shoulders by white leather slings, not at the side as formerly. [Footnoted: Lawson, Vol. III, p. 48.] Knapsacks were not always carried by Light Infantry. It was an age of folly as regards the dress and equipment of the soldier and although we did not go quite as far as some of our Continental neighbours an account of French infantry seems worth quoting. [Footnoted: Lloyd, Review of the History of Infantry, Longmans Green, 1908, pp. 179, 180.] "Uniforms; folds, facings, pockets and linings were reduced to fictions indicated by piping. From Germany we borrowed crossbelts which compressed the chest, but had the advantage of throwing the sword to the rear to knock against the calves, and the cartridge box to quarrel with the haversack; long gaiters, which squeezed the legs and stopped the circulation in that useful member of the footsoldier; stocks, which forced him to keep his head up, even with the sun in his eyes, and their corollary the shako, which had to be balanced; curl papers for the hair and tight queues. The soldier was uncomfortable, it is true, but he was smart. His toilet was said to take him three hours a day." In our service the shako came in in 1800 and the queue lasted until 1808. The gaiters, short in our case, went out of service by 1812, the stock we kept for a long time. 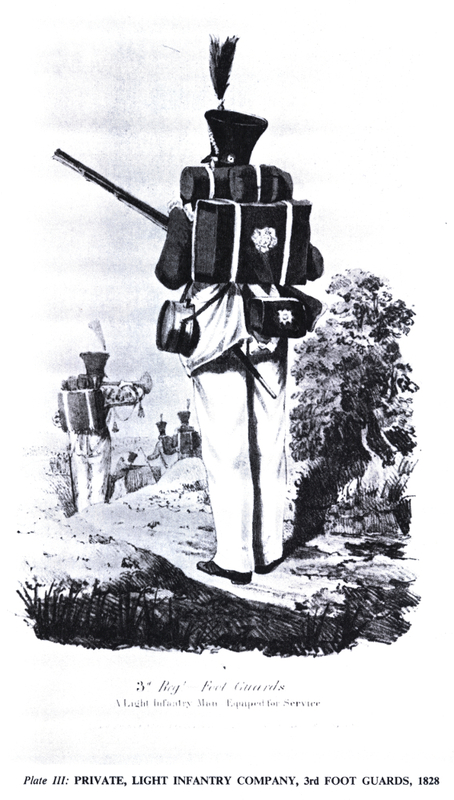 To add to the compression of the chest by the crossbelts in 1789 we began carrying the knapsack squarely on the back with straps round each armpit and, even worse, another connecting them across the chest. This latter abomination was often undone on the march—but it lasted for three quarters of a century. The French had calf or goat skin knapsacks with the hair on and when a sergeant got a commission it was customary for the other sergeants to "shoot his pack to pieces" as the phrase went! Obviously the more rations a man carried the more independent he was of transport. So the French issued 14 or at times 15 days' bread. [Footnoted: Ward, Wellington's Head Quarters, O.U.P., 1957, p. 51.] In the Peninsula we issued the Portuguese troops with 6 days' rations and both they and the French made the issue last the required number of days. Not so the British soldier. According to Wellington it was unwise to trust him with more than one day's rations at a time, as he would eat as much as he could at once and either throw the rest away or give it to local inhabitants. There was at one time a standing order [Footnoted: Wellington's Despatches, 9/6/1812, 10/8/1813.] that if 3 days' bread was issued it must be inspected twice a day to see it had not been jettisoned. Benjamin Harris, a Rifleman and shoemaker, [Footnoted: Recollections of Rifleman Harris, edited H. Curling, published Peter Davies, 1928, p. 1.] whose memoirs deal at length with the load he carried, was "convinced that many of our infantry sank and died under the weight of their knapsacks alone." He adds "that except the beef and biscuit, the eighty rounds of ball cartridge was the best thing he carried." His Regiment, now the 3rd Royal Greenjackets, carried twenty rounds more than the allowance for a Line Regiment. We may note especially Harris's pride in the ammunition he carried, because at this time and up to modern days a proportion of British infantry had a most unfortunate penchant for either jettisoning their ammunition, especially if extra rounds were issued, or selling it for liquor. [Footnoted: Fortescue, Vol. II, p. 622, written in 1917. Wellington's Despatches, G.O. 18th June, 1809; 1st June, 1810; 2nd September, 1812. See also Molvneux. Campaigning in South Africa and Egypt, Macmillan, 1896, p. 280.] Wellington noted that on one occasion during an engagement some of the men ran out of cartridges after only five minutes' firing. The normal rate of fire was 3 rounds a minute and "a soldier can expend all the ammunition he can carry in two hours". [Footnoted: Wellington's Despatches, Vol. VII, p. 641.] Inspection of ammunition in the men's pouches was another frequent occurrence in Wellington's army. The writer has not seen any explanation of this surprising attitude to his weapons on the part of some of the rank and file of one of the bravest and hardest fighting armies that ever existed. The facts are as stated and that is all that he has to say about it. In 1824 the knapsack was lightened and made to fit closer to the back so as to relieve the loins. There was no attempt made to balance the load on the back by placing some amount of weight in front as a counterpoise. In 1829 the frame of the knapsack was strengthened and in 1856 a smaller pattern was adopted. Not until 1871 was the "box" pattern superseded. In the forties there was a partial issue of a waistbelt with a frog for the bayonet. This belt took a smaller pouch, which could be refilled from the old cartridge box on the crossbelt and was quicker to load from. The introduction of the copper percussion cap, which replaced the flintlock, at the same time provided a fresh problem in the design of accoutrements. The civilian usually carried percussion caps in the right waistcoat pocket, so the soldier had his in a small pouch either in a slit in the coatee on the right side low down or else the pouch went on the waistbelt. For a time it was on the crossbelt which took the large cartridge box. With the latter, as already explained, a man had to get his next door neighbour to take out the bottom layer of cartridges, so inconveniently was it hung. Renbourn describes the crossbelt and cartridge box as "tight over the chest and bumping the man's posterior. The knapsack straps cut the shoulders; and causes swelling, weakness and numbness of the hands or arms lasting up to 24 hours after a march with loss of strength and pressure on the nerves, muscles and blood vessels." Writing as late as 1866 General Sir William Butler [Footnoted: Butler, Autobiography of General Sir William Butler, Constable, 1911, p. 193.] explains how the knapsack, which the men on guard had to wear for 24 hours, broke many a man's health down before he was forty, bringing on what the men called "them pains". He noted that the bandsmen, who never did guard duty, did not suffer in this way. To revert to the fifties of last century, when a total of 68 lb. including 3 days' food and a blanket was carried, [Footnoted: Luard, History of the Dress of the British Soldier, 1852, p. 140.] there is a curious story vouched for by two sources [Footnoted: Wood, Field-Marshal Sir Evelyn, V.C., Midshipman to Field-Marshal, Vol. I, p. 248. P. P. J. Coetser, Gebeurtenisse uit die Kaffer Oorloge, published Paarl, South Africa, 1897, p. 55. Coetser was an Afrikaner guide. Major-General Sir William Eyre, K.C.B., 1805-59, was a fine fighting soldier with a violent temper, much respected by his subordinates.] of a happening during a campaign in the South African bush in 1852. Major General Sir William Eyre, as he became later, was commanding the 73rd who carried 2 blankets, a greatcoat, 70 rounds and 7 days' rations. Knapsacks were never carried in Africa. The marching was very severe and there were stragglers whose blankets and rations Eyre had burnt! This is, no doubt, an exceptional case but should be of interest! The campaign in the Crimea in 1854 was remarkable in many ways. The troops landed in full dress carrying 50 rounds, three days rations, a greatcoat and blanket, containing in most cases a pair of boots, socks and by special request of the men a forage cap. The latter was to replace the top heavy uncomfortable shako. Knapsacks were left on board ship by mutual agreement, though no order was issued to that effect. [Footnoted: Wood, The Crimea in 1854 and 1894, Chapman Hall, 1895, p. 25. Burgoyne, super cit, p. 247.] The knapsacks had mostly been pillaged when returned to the units. The men had been too weak to carry them owing to sickness. Lord Wolseley, writing in his Soldier's Pocket Book in 1869, would have none of the knapsack. He calls it a pack, as was common parlance. He wished to introduce a waterproof sheet with straps to hold a blanket, greatcoat, one shirt, one pair of socks, one towel and a piece of soap, a total of 14 lb. He gives the weight of arms and accoutrements as 16 lb. 2 oz. and ammunition 5 lb. 7 oz. This was with the newly introduced Snider breech loading rifle taking a cartridge with the percussion cap as an integral part. Although from this time onward more ammunition was carried the weight of it did not increase as the reductions in the calibre of the rifle made the ammunition lighter round for round. As Wolseley wrote, "it is absurd to expect a man to carry a portmanteau full of things on his back", so he opposed spare boots, shirts, etc., being included in the soldier's load. The pack itself weighed 3 lb. 3 oz. By dispensing with it Wolseley claimed that the total weight carried would be 43 lb. 2 oz. including the man's clothing and one day's rations. This was a considerable reduction from the 56 lb. 12 ½ oz. carried in heavy marching order. Although the future Field Marshal only proposed that one day's rations should be carried, he was strongly of the opinion that it was practical to issue more, and that the soldier of 1869 would conserve his rations and not waste them as formerly. How much weight Wolseley's views carried is uncertain; his book was supposedly frowned on by authority, but in 1871 very great changes in equipment took place, and the so-called Valise Equipment was introduced. The knapsack was replaced by a black waterproofed canvas bag or valise, worn over the small of the back and supported over the shoulders by straps split into three at the level of the third button of the tunic. These straps were fastened to a waistbelt which had two pouches, each holding twenty rounds, one on each side of the belt clasp. A further thirty rounds were carried in a so-called "ball bag" slung below the right hand pouch. These pouches when full partially balanced the valise, which had the rolled greatcoat above it, then the rolled cape and the mess-tin level with the man's neck. The cross belt with the old cartridge box, described as "inaccessible", disappeared. For the first and last time the "pack" was carried low well below the shoulders. The bayonet was carried on the waistbelt on the left side with the haversack. Two serious difficulties arose from this equipment. The bayonet, longer than before, in its new position was apt to get between a man's legs when doubling [Footnoted: Renbourn, p. 6, para. 10: "In 1829 at the double the soldier had to put one hand on his cap and the other on his pouch; and what became of his musket?" Kipling, From Sea to Sea, Vol. I, Ch. xv. Written of May, 1889, on Japanese infantry, "when doubling clutching at the bayonet to keep it from tripping them up and at the pouch, as one can see in running firing on ranges in India at any time."] and the ammunition tended to fall out of the pouches when firing in the prone position. The man then got up in a hurry, probably to advance at the double, and had to fasten his pouch, [Footnoted: Major-General Sir George Aston, Memories of a Marine. "At El Teb in the Sudan in 1882 the shiny pouches were difficult to open in the prone position and rounds fell out when the men got up."] grab at his bayonet to keep it clear of his legs, in some cases steady his headdress to stop it falling off and of course carry his rifle! The obvious corollary to the introduction of rapid fire breech loading arms was that practically all firing would be done lying down. A partial solution to the difficulty of using pouches was found in due course and will be discussed later on. 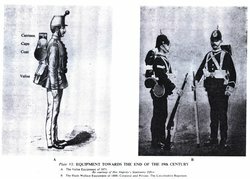 For some time serving officers had been working on an equipment which would obviate many of the difficulties of the 1871 and 1882 patterns. In 1888 Colonel Slade, on half pay from the Rifle Brigade, and Lieutenant-Colonel Wallace, late King's Royal Rifle Corps, introduced the equipment called after them the "Slade Wallace." It was made of leather, although webbing was already making its appearance as a substitute in army equipment, was designed for any climate and had the great advantage that the valise, which had been reduced in size, could be taken off in a few seconds and replaced by the haversack, waterproof sheet or blanket. The valise now rode high on the shoulders with the mess-tin and greatcoat below, and the complete weight in heavy marching order was 41 lb. Including arms and ammunition and uniform the man carried 56 lbs. reduced to 38 lb. when the valise was carried on regimental transport. This had always been done in India and Africa, a practice considered very unsatisfactory by those responsible for the big Continental Armies! Although the weight of the ammunition carried remained more or less constant the number of rounds thought necessary increased steadily with the introduction of rifles of smaller calibre capable of more rapid fire. With the Martini-Henry .45 in., 70 rounds, rising to 90 with the Lee-Metford Magazine arm of .303 in., were carried and in 1888 ten more were added and the same with the Lee-Enfield of 1892. Although other armies were loading magazine arms with clips or chargers holding usually five rounds our only reaction was to issue a second ten-round magazine carried on the left brace above the pouch and this only for a short time. So we continued to reload with single rounds, and retain the pouches. The Martini was still on issue when the new kit was being tried out and four officers quartered at Portsmouth carried out a route march to London, dressed as privates with full heavy marching order kits. They covered 35 miles to Farnham on the first day and on the next day 24 miles to ligham, being inspected en route at Aldershot. On the third day they reached London, 28 miles, and were inspected by Army H.Q. including Lord Wolseley. The trial was considered to have been successful, but it was noted that if no ammunition was carried the waistbelt had to be considerably tightened to keep the weight on the back from dragging it up. This then was the position when the South African War of 1899-1901 started; our infantry used the Slade Wallace equipment with the two pouches on the front of the body; the Mounted Infantry, in time a large body of men, had a 50-round bandolier and our enemies, the Commandos of the two Republics of the Transvaal and Orange Free State, had a 50-round leather bandolier with pockets each holding a five round clip for their Mauser rifle. The pouches can be dealt with as unsatisfactory. Not only did rounds fall out when firing, as was practically always the case in the prone position, but if firing behind low cover a man could be hit through the right elbow when he put his arm up to get a round out of his right hand pouch. A man would grab a few rounds and put them in front of him, frequently leaving some if ordered to advance. Otherwise the man was not unduly encumbered, as he carried the rolled greatcoat on his waistbelt at the back with the mess-tin on top and no valise, a weight of little over 25 lb., according to Major Renbourn. To use his words "the British infantry were now true light infantry"! As soon as possible all arms were issued with a leather bandolier holding 50 rounds with flaps fastening over. Either one or two were issued and normally worn over the shoulders or one round the waist. Mounted men often carried the second bandolier round the horse's neck. But before this bandolier was on issue we had ordered a very large number of web bandoliers, holding each 100 rounds in two rows, as used by United States infantry in the Philippines. [Footnoted: A. A. Lethem, The Development of the Mills Woven Cartridge Belt 1877-1956, published 1956 by the Mills Equipment Company Ltd., 25 Victoria Street, S.W.1, for private circulation only. P. 11.] They were designed as waistbelts but British troops used them as bandoliers over one shoulder. They had given trouble in the Philippines [Footnoted: Lavisse, Sac au Dos, Hachette, Paris, 1902, p. 223.] as the loops were apt to stretch and rounds fell out when men stooped or lay down and the same fault developed in South Africa. It was Mr. William Lindsey of Boston, Massachusetts, U.S.A., who brought these bandoliers to the notice of the War Office and set up a small plant in North London to manufacture them. This was the start in this country of the Mills Equipment Company, which has been responsible for the equipment of the British Army ever since. In spite of the purchase of web bandoliers of the standard US. Army pattern—many were on issue in Great Britain in the very early stages of the war—there was still a serious shortage of bandoliers. For some time a canvas carrier slung over the shoulders had been part of the equipment of the Battalion ammunition mules. It could be used to take cartridges to the firing line when it was impossible to carry a box from the mule. This idea was taken further by the manufacture of a flimsy woven bandolier holding 100 rounds in loops, which could be delivered in the field and the belt itself thrown away. So great was the shortage that these carriers were issued and worn by the troops. They wore out quickly and were the cause of thousands of rounds being lost in the field. In 1902, while the SA. War was still in progress, Commandant E. Lavisse of the French Army wrote a most authoritative book on weights carried by infantry. [Footnoted: Lavisse, Sac au Dos, Hachette, Paris, 1902, p. 223.] He had made an intensive study of the whole of the major armies of Europe and of that of the United States. The U.S.A. Infantry carried the highest weight of any army, 28.5 kilos, but the highest load of any unit quoted was the 32 kilos pack, etc., of the French Chasseurs Alpins. Germany carried 26.7 kilos; Russia 26.4 kilos; France 24.4 kilos. but with a section of a tent 2.6 kilos. more. Great Britain carried 23.6 kilos. the mean weight carried was 26.5 kilos, about 58 lb. Lavisse had no very fixed idea as to where the pack should be carried on a man's back. He was very much against extra rounds being carried in the knapsack or in the haversack. This was done by the Germans [Footnoted: A. A. Lethem, p. 41, bottom para.] and as Lavisse stated it is obviously difficult to get one's knapsack during an action! He was also strongly against the knapsack being carried in any way by the transport and laid it down that the soldier must never be divorced from his pack. He thought that about 60 lb. was a maximum load. So with the Slade Wallace equipment we were slightly below his maximum. As we were within measurable distance of fighting a major war on the Continent and elsewhere this summing-up of the general position as regards the infantryman's load should be relevant. Immediately after the South African War we rearmed with a new version of the Lee-Enfield magazine rifle using clips of five cartridges to replenish the ten-round magazine. With it in 1903 we issued the Bandolier Equipment, which weighed about 40 lb. and had no pack, its place on the pack being taken by the greatcoat, folded and carried high. The mess-tin was on the waistbelt below the coat, the waistbelt being a bandolier with five pockets, each holding two clips of five rounds each. A second bandolier over the left shoulder held a further 50 rounds. The illustration from the Mills Cartridge Belt book reproduced here shows the equipment front and back. Exception was taken in some quarters to the retention of the shoulder straps for the waterbottle and haversack, and opinion was veering to the importance of carrying more than 100 rounds on the men. The 1903 Bandolier Equipment went to all Imperial and Colonial troops as well as to the Regular Army. 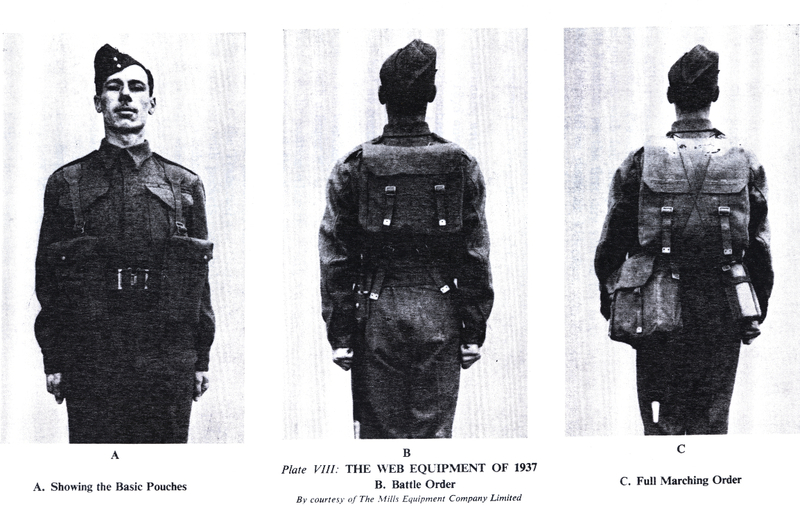 Just after the adoption of this kit the Mills Equipment Company were carrying on with experiments with webbing and in 1905 had designed a light woven web bandolier with five pockets each holding two clips as in the UP. leather pattern, which was a development of the Emergency type already noted as being issued during the South African War. Re-made in 1914 in light cotton drill, stitched not woven, and taking 100 rounds, this belt played an important role in the first World War. To revert to the situation in 1905, 1906. Authority at the War Office was taking an increasing interest in web equipment in place of leather, and in about June 1906 Major A. R. Burrowes, 1st Royal Irish Fusiliers, laid before the War Office a new idea for distributing the load on the soldier. There were to be two straps or braces only going over the shoulders, crossing at the back where the pack rode with the top just below the shoulders, and there were to be five pouches each holding 15 rounds on each side of the waistbelt, three on the belt and two above on the brace. The waterbottle, haversack, bayonet and entrenching tool all went on the waistbelt, which could be unbuckled and the equipment taken off in one unit and put on again like a coat. Major Burrowes was put in touch with the Mills Company; it was decided to use webbing instead of leather and in December 1907 the equipment was approved by the Army Council and finally by the King on 30th January, 1908. The 1908 equipment could be worn with the waistbelt unbuckled and with the cartridge pockets empty without any loss of balance. It is said to have had the advantages of the Alpine rucksack without having straps passing over the shoulders and round the arms. With slight variations this equipment was also manufactured for some Territorial units, for the Indian Army as a Greatcoat Carrier and in various forms to other armies as well. The German Army was still carrying 90 rounds in two old-fashioned pouches on the waistbelt with a reserve of 30 rounds in the knapsack. 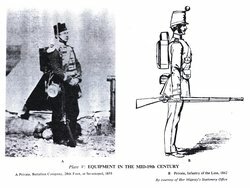 There is little doubt that even though the musketry of the British Army was very superior indeed to that of their enemy our men were very much helped by the accessibility of the 150 rounds on the man and a further 100 rounds readily available in the Emergency bandoliers already mentioned. The weight carried with the 1908 Equipment is given as 59 lb. 11 oz. Edmonds, the historian of the official account of the War, states that in 1916 this had been increased to 66 lb. Later as more and more items were added the soldier carried 74 lb. in summer and 80 lb. in winter, increased in wet and muddy weather conditions by 14 lb. So by the end of the War in 1918 the infantryman could be carrying 85% of his own weight, described by Major Renbourn as "the greatest weight known in history." He was relatively much worse off than the army pack animal and it was estimated that five to seven miles a day was about the limit he could march, and that then he could well be completely exhausted and not fit for further effort. The conditions of trench warfare, the need for steel helmets as protection against shrapnel, for sandbags for use in any of the numerous emergencies, for extra ammunition for use by men who could fire up to 30 aimed rounds a minute, [Footnoted: Brigadier J. A. Barlow, C.B.E., Elements of Rifle Shooting, 1932, Ch. v.] and the intro- duction of Light Automatics all tended to put up the weight carried. None of these things had been foreseen and so the foot soldier, who had started the war with very reasonable equipment, found himself more and more overburdened. About 1932 a Committee under General Sir Walter Braithwaite was formed to go into the whole question of clothing and equipment for the whole British Army. By March 1934 a new equipment had been decided on, but re-equipment of the Infantry was deferred because of the forthcoming introduction of automatic rifles. This would necessitate a fresh approach to the question of ammunition carriers on the man but, as we know now, the advent of a self-loading arm was to be deferred until long after the next war. In 1935 the Braithwaite Commission pointed out that the soldier had been definitely overloaded in the last war and that there appeared to be a few if any instances of his running out of ammunition. The dread of this had been a bugbear to the authorities of all armies since the introduction of breech loading arms in the eighteen-sixties and of magazine arms before the end of the century. Up to this time in the British Service 300 rounds of SA. 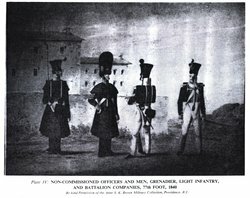 with the troops had been considered sufficient per man at the start of a campaign [Footnoted: Aide Memoire to the Military Sciences, published R.E., 1853, p. 153. Sixty rounds carried with 300 in reserve. Estimated to last six months. Lieutenant-Colonel Grierson, The British Army, published Low Marston, 1899, p. 118, including pouch ammunition 309 rounds carried per man.] and the experience gained in three wars had not settled the question of how much should be carried apart from that of the necessary reserves. The Commission decided that a man should carry 50 rounds in marching order and 100 in battle order. They put the average weight of a soldier in peacetime at 135 lb. and recommended that, if practicable, he should not carry more than a third of that weight. The pack should be carried high on the shoulders and there should be no equipment below the waist. Major Renbourn did not consider their conclusions in any way revolutionary. 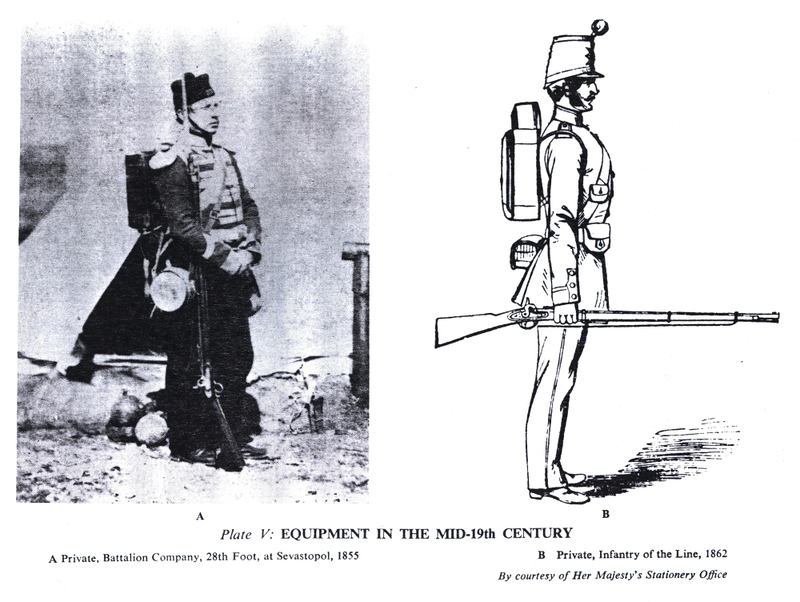 He states—"the principles used today in load carriage were already well known long before the end of the Nineteenth Century" and he wonders if the soldier is in fact better off today than he was after the introduction of the Valise Equipment in 1871! In 1939 the Braithwaite Battle Dress Equipment was issued. In appearance, at any rate, it was revolutionary (see illustration). It was lighter and once again it was laid down that the pack was not normally to be worn. The soldier's clothing of drab serge weighed from 11 lb. 11 oz. to 13 lb. 14 oz., the pack (if worn) and greatcoat, about 11 lb., the steel helmet with cape and respirator 13 lb., 2 pouches and 120 rounds 10 lb.—they were rectangular and known as "Basic Pouches"—rifle and bayonet 9 lb. 11 oz., a total of 48 lb. 11 oz. without the clothing. The haversack when full weighed 5 lb. and could be worn instead of the pack; the same straps were used and the method was known as the "Rucksack" one. The pouches were worn on braces and the waterbottle either in a carrier on the waistbelt, in the haversack or in one of the two front compartments or pouches. These besides the Basic Pouches could be Carriers taking 40 rounds between two. For extra magazines for the Bren Light Automatic two large rectangular "Utility Pouches" could be carried front and back. Although a Report on Battle Dress called for from all units in May 1943 after the capture of Tunis and the end of the war in North Africa is strictly speaking outside the bounds of this account it seems worth noting. The general trend of the answers from all formations of XVIIIth Army Group were satisfactory and approved of the 1939 Equipment. In a summing up by Colonel]. A. Barlow, later Brigadier C.B.E., Weapons Technical Officer (Field Force) he commented that if mixed types of ammunition were carried in the Basic Pouch the various objects were apt to inflict damage on each other. [Footnoted: From an interview with Brigadier Barlow.] [Footnoted: The following note was sent by Brigadier Barlow after he had read this article: "After the surrender of enemy forces in North Africa (May, 1943), Brigadier Barlow prepared a detailed questionnaire regarding all infantry weapons and kindred equipment. The questionnaire was delivered and explained to each Infantry battalion and Brigade and Divisional H.Qs. by officers of his Weapons Technical Staff (Field Forces). The answers were collected by the same officers a fortnight later. The general trend of reports on the 1939 webbing equipment were satisfactory. However, in his summarised comments on the basic pouch, Brigadier Barlow commented that if mixed types of ammunition were carried in the same pouch, e.g. a grenade or two with Sten magazines, damage to the latter would be probable. He further commented that stowing the individual chargers of rifle ammunition, or complete factory-filled bandoliers, in the basic pouch was not the best answer for the rifleman, since firstly the rounds became loose in the charger, and in the second case chargers were not immediately ready for use in an emergency. Many units carried rifle ammunition in the factory-filled bandoliers slung across the body over one shoulder, but the same remarks regarding immediate and dependable availability applied. He strongly advocated a return to a modified form of the former webbing rifle ammunition pouches. This to contain say twenty rounds in two pouches on a single base, each pouch being divided into two compartments to hold one charger apiece. This suggestion would guarantee the rifleman twenty rounds of immediately usable rifle ammunition securely packed and held in chargers, in addition to the ten rounds in his magazine. Such pouch to be located on the right-hand side of the belt beside the basic pouch. Apparently nothing came of this suggestion."] Otherwise the Equipment had emerged well from as drastic a series of tests as can well be imagined. It would appear from this survey of three hundred years on what the British Infantry man carried that there is no very great difference in the actual weight between the musketeer's load of 1640 and that of the Poor Bloody Infantryman of 1940. There is, however, a very considerable difference in the way in which he carries it, though possibly not in the way in which he refers to his burden!